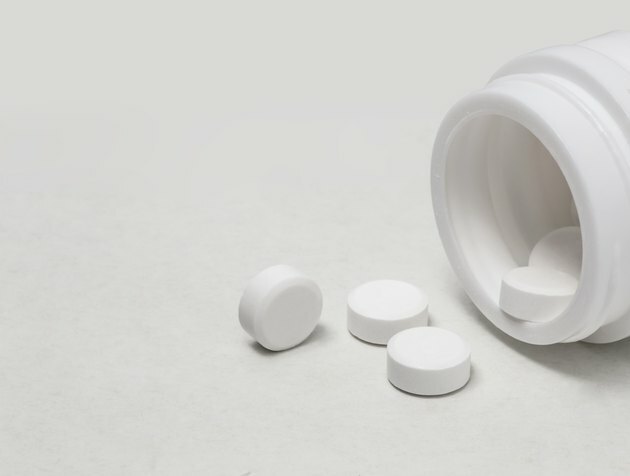 Aspirin has blood thinning properties similar to those found in medications called anticoagulants, which slow the normal clotting of your blood. Beta blockers are a class of medications commonly used to treat cases of high blood pressure. Use of either aspirin or beta blockers can harm your health in combination with fish oil. Use of aspirin with beta-blockers can also potentially cause problems. Seek your doctor's advice before taking any of these medications. Anticoagulants achieve their effects by reducing the "stickiness" of components in your blood called platelets, which normally clump together and form beneficial clots that stop your blood flow when you bleed. In people with heart disease, unwanted clot formation inside arteries can slow normal blood flow and greatly increase risks for heart attack and stroke. Beta blockers achieve their effects by blocking the effects of the hormone adrenaline on receptors in your body called beta receptors; in turn, lowered response in these receptors leads to lower heart stress and, consequently, lower pressure in your blood vessels. Fish oil contains active ingredients called omega-3 fatty acids, which appear to moderately lower your blood pressure by widening the interior of your blood vessels. Omega-3s also reduce your blood's normal tendency to clot, and on their own, daily doses of fish oil in excess of 3 g can increase your risks for uncontrolled bleeding. In combination with aspirin or any anticoagulant, use of any amount of fish oil can potentially increase your bleeding risks. In combination with beta-blockers or any other high blood pressure medication, use of fish oil can lower your blood pressure too far and endanger your health. Aspirin and beta-blockers are both used to treat or prevent problems related to your cardiovascular health. Before you use these medications in combination, you need to seek your doctor's advice and approval, according to the National Center for Biotechnology Information's PubMed Health. In some cases, your beta blocker levels may need to be adjusted or you doctor may need to monitor your medication reactions more closely. Before you use aspirin, you also need to speak with your doctor if you use other medications that can affect your cardiovascular health, include anticoagulants and ACE inhibitors. Commonly used beta-blockers include metoprolol, atenolol, nadolol, labetalol and propranolol. Commonly used anticoagulants include heparin, clopidogrel and warfarin. Commonly used ACE inhibitors include catopril, lisinopril, benazepril and fosinopril. The U.S. National Library of Medicine's MedlinePlus characterizes the risks of combining fish oil with high blood pressure medications as moderate and the risks of combining fish oil with aspirin and/or anticoagulants as minor. Other medications that can trigger undesired effects in combination with fish oil include birth control pills and the fat absorption blocker orlistat. Consult your doctor for more information on fish oil, aspirin and beta blockers.